Samsung is in no hurry to bring out its first commercial flexible AMOLED displays, thanks largely to the fact traditional displays are doing just fine. Reports from Korean website ETNews indicate that Samsung has placed the bendy AMOLED screens on the back burner until next year. Instead, the company apparently wants to focus on increasing flat display production. Samsung is seeking to increase its AMOLED production from 56,000 units per month to a 64,000 unit per month yield to keep up with demand for current smartphones like Galaxy S3 and Galaxy Note 2. To meet that increase in production, some of the pilot lines manufacturing flexible AMOLED displays have been converted to glass AMOLED lines, slowing bendy AMOLED progress. Reports from earlier this year indicated that Samsung decided to delay flexible AMOLED screen production due to issues with the yield and production schedule problems. At the time it was thought that if the flexible AMOLED issues were solved by the end of the year, consumers could expect to see the first devices using the technology by mid-2013. Whether that 2013 marker will be affected by Samsung's take-it-slow attitude remains to be seen. 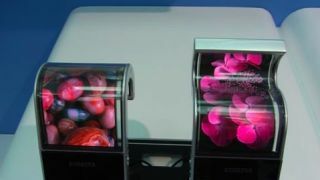 Samsung's bendable, twistable displays were last seen in December 2011 when the company released a concept video of the technology in action. Unlike traditional glass AMOLED displays, the flexible screens are plastic-based, requiring a different production method but making them nearly indestructible. A practical application for the curvy screens on a smartphone or tablet is still anyone's guess, but the technology has an undeniable cool factor that has everyone eager to see what form the malleable displays ultimately take.